"Saved!" - Part 1: "The Testament of E.D. Murray"
NotAnS: Did u see the news? NotAnS: EdFree did it again! And IT happend AGAIN!!!!!!!!!!!!! L0c0m0tiveF8: no way! Superman saved him again? L0c0m0tiveF8: man that is every shade of awesome praises be! NotAnS: Hells yeah its going ahead! Your still in, right? NotAnS: Man, that would be an honor! Itd be great to finally meet and show SUPERMAN his destiny together! NotAnS: How about LexCorp? It'd so cool to get saved by SUPERMAN right in fromt of Lex Luthor! ROLF! NotAnS: Nice! Maybe we can get Lois Lane's autograph! L0c0m0tiveF8: hehehe and her number hehe okay man so the time is same yeah? NotAnS: Lol! Yep! How about we hook up outside of the Planet about 20 minutes before? L0c0m0tiveF8: works for me man how will i know you? NotAnS: Excellent! PRAISES BE! PRAISE SUPERMAN! Story - 3: The autumn comes for me carrying all the instruments of contemplation and beauty. In these shifting seasons I often become a little more socially introverted, yet more personal in my literature. Here we are, in this hemisphere anyway, in the serotinal season, and my autumnal muse is taking color. So, and please indulge me, in this review I can't help but be a shade more personal than usual, but not solely because I tend to be so at this time of year, but also because this story struck a chord with me. In fact it down right played for me a tune so doleful - a coronach, an epitaph - that I couldn't finish reading it in one sitting. Last November, at 11:45 on the morning of the 27th, my best friend went into a building across the street from his. He took the elevator to the 17th floor, opened the window in the stairwell, and leaped. When I saw his body, asymmetrical and unnatural, I hoped for one thing, and wondered about another. I hoped that he had died before the impact, that somehow in the mere seconds it took for him to fall seventeen stories, he passed away. I wondered if as he dropped out of the window he regretted what he had done. Free falling, unable to stop, surely, I thought, images of his two boys burned themselves into his mind. I think of my little girl a myriad of times a day. And this is where the not-understanding comes in. I'm excited about seeing my ankle-biter grow, but my friend decided that he wouldn't be witness to the lives of his two sons, that he was unworthy of their need of a father. The reasons for that are his, and they aren't clear, but was regret the last thing he felt as his breath let slip? In this story, Superman suggests that second thoughts are common for jumpers. 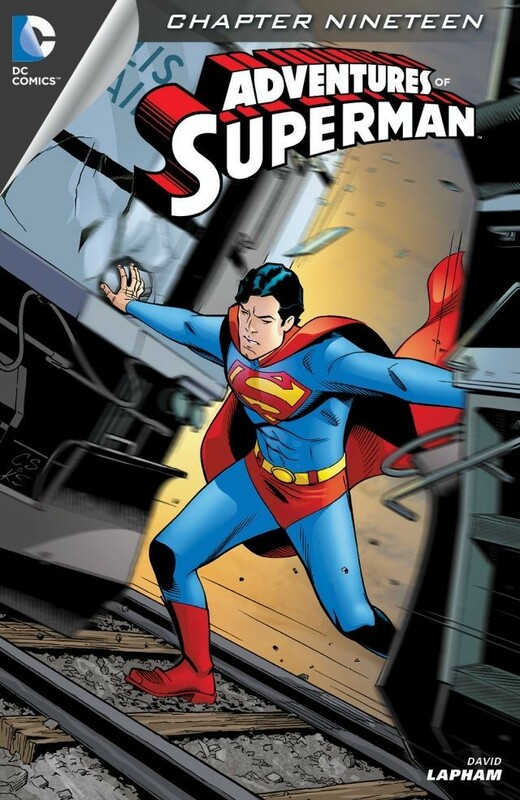 But of course in the fantasy city of Metropolis there's Superman to catch those who choose that alternative route, letting that regret turn into relief. The crux of the story, however, is not relief, but faith. Like all faith, in this story it is blind, and, as far as I stand on the idea of faith, fallacious. The Church of Superman is so preposterous that its 900 members believe that they owe Superman something, that they are blessed by the opportunity to let Superman save them. They are unmoved to the extant of ignorance, a bliss that is accentuated by their faith. And in that I see a commentary on us, the actual "Church of Superman." Let's abandon the religious context, and just say Superman fandom. We are a massive group of global citizens who share an adoration for Superman. That is our relationship with one another even before we meet, if ever we do. However, not too unlike the fans in the story, we can be collectively shortsighted and empty minded. Instead of coming together for the absurd purpose of believing we can show Superman he can save all us, we often come together with the even more absurd result of moving away from what Superman represents. So many of us in the fandom have an unyielding view of and unbending attitude towards Superman that the idea of collectively enjoying and creatively discussing him is almost obsolete. Too often Superman brings us together only for us to distance ourselves from one another, choosing instead to pass around snarky quips, scoffing discontent, and elitist ridicule. It is interesting and unfortunate that the kindest, most sincere superhero has what may be the most disjointed fandom. It seems to me that few of us who speak of the greatness of Superman actually actively strive for that greatness. But Superman is all about hope. I have hope for our fandom, and it isn't the misguided hope of the fandom in this story. It's a genuine hope that our admiration for the Man of Steel manifests into greater respect for one another, a more sincere striving for truth and justice, and a deeper commitment to life - not only our own, but for those whose own lives depend on ours. And with that particular thought in mind, it's a hope that more windows on building tops remain closed. Art - 3: There are some rough edges around the art, and it's not really the intriguing kind. Much of the art seems a little slapped together. Cover Art - 2: No, sir. I don't like it. There's no weight to the action. As far as I'm concerned, one point of difference between good artists and great artists is the ability to clearly render movement. Great artists are illusionists, making us believe that a static drawing is mimicking action. This cover fails to do so.